It’s always a challenge to describe an artist’s work, whether in painting, music, or poetry. Sebastian Smee is well-recognized for doing this successfully as an art critic. He has been with The Boston Globe since 2008 and in 2011 won the Pulitzer Prize in Criticism. In this book he has devised an original way of looking at eight well-known artists. 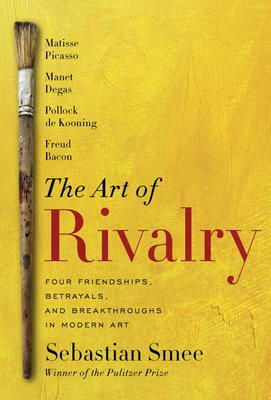 He pairs them off by country and date, and looks at the effects of both their friendships and rivalries on their work. In the chapter on Manet and Degas he describes the close friendship that developed between the warm, outgoing Manet and the reserved bachelor, Degas. This came to a head in 1868, when Degas had painted a portrait of Manet and his wife Suzanne. Not long after this Degas paid a visit to Manet’s studio and saw that someone had taken a knife to the portrait, which had gone right through Suzanne’s face. The culprit turned out to be Manet himself. Smee says no one has ever discovered an explanation of this. Degas took down the still life Manet had given him and returned it to him. This friendship apparently recovered. There are interesting chapters as well on the pairs: Freud and Bacon of the UK; Matisse and Picasso in France; and Pollock and De Kooning in the U.S. The book has good illustrations to accompany a very interesting text.